Billie Whitelaw stars in this dramatic and very well made British Crime film. Optimum UK R2 DVD. Written by George Baxt, Payroll is a pretty typical heist movie storyline - the build-up and planning, the execution, the hiding/tracking down of the criminals. Fortunately it is in the details that this film excels. The opening is rather confusing with an array of similar looking characters making it hard to tell exactly what is going on, however the characterisation soon starts to build up, on both sides of the law, so that by the time the atttack takes place we really know all of those involved. The aftermath avoids the usual clichés and the film builds to an effective climax with several unexpected turns along the route. The script follows the social realist trend of the 1960s so all of the characters are normal working men (and their wives) and all presented in a very realistic manner - no good and evil - and it is this that really makes the events more shocking - particularly the attack on the truck. Despite concerns however, the film does avoid wallowing in sentementality after the deaths and the sequence is presented with almost heartwrenching understatement. Unusually, the police proceedurals are kept to an absolute minimum and throughout the film the police are very minor characters. Director Sidney Hayers directs Payroll solidly - there is some genuine tension early of with the theft of documents from an office and the build up to the attack is very well helmed, really leaving you on the edge of your seats. The attack on the truck is an incredible sequence with genuinely shocking violence and sound that contrasts with the otherwise very quiet opening part of the fillm - certainly one of the highlights of the film, it ranks among the best such sequences in all of crime cinema. A later alley fight is also well shot. The real Newcastle locations add some great authenticity and the film is really boosted by a minimalist soundtrack. Although actor Michael Craig is top billed, it is Billie Whitelaw who really steals the show as the vengeful Jackie with an superb performance that fits perfectly with the understated script. Michael Craig himself is certainly not bad in the role and there are solid performances all round, with a selection of familiar character actors. 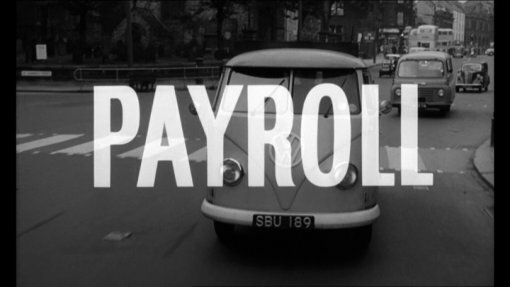 Not the most original crime story, but very well executed, solidly written and boasting a fantastic lead performance, Payroll is a solid example of the 1960s social-realist Brit-crime films and comes recommended to all fans of the genre as well as being a good place for newcomers. Directed by anyone interesting? Sidney Hayers - best known for helming the British horror films Circus of Horrors (1960) and Night of the Eagle (1962) he went on to do a lot of television work in the 1970s. Any gore or violence ? A few violent sequences and some blood. Recommended to fans of British Cinema and 1960s crime films. Visuals Original Aspect Ratio - 1.66:1 widescreen. Anamorphically enhanced. Black and White. The film is strong visually, with minimal print damage, good detail and only light grain. A vividly brutal attack is the highlight of this strong British Crime film that comes recommended. A fine print, although sadly completely lacking in extras. All text in this review written by Timothy Young - 27th January 2008.